Bearings are angles measured clockwise from north, which is usually drawn vertically up the page. A bearing is a three digit number from 000° up to but not including 360°. We don’t often use decimal parts of a degree in giving bearings. 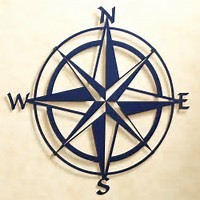 Compass directions (North, East, South, West) have bisections NE, SE, SW, NW lying between the two major compass points. These are then divided again by NNE, ENE, ESE, SSE, SSW, WSW, WNW and NNW. 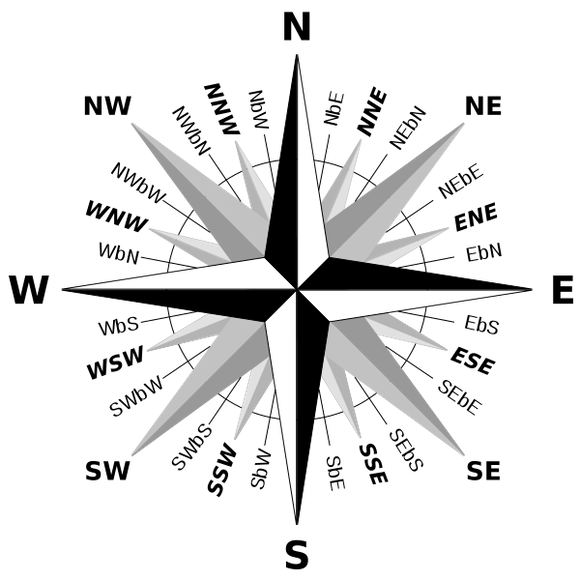 There are, rarely used, further bisections so that from North to East the full range is North, N by E, NNE, NE by N, NE, NE by E, ENE, E by N, and E. This implies 32 compass points. Write the full set of nine compass points from South to West. Comment on this: a rich area of study because the trig already introduced is used to generate answers. However, because the calculator finds the first available angle in a solution set, that answer is often in need of further processing to produce a bearing. This then encourages students to draw diagrams and to make sense of their work. Those using Rec() and Pol() as solution techniques are especially in need of (and especially benefit from) this need to confirm the sense of an answer. A few students declare this very difficult – but they do achieve significant learning. Expected knowledge includes the simple idea of a ‘back bearing’, 180° different from the forward bearing. Since you can’t have a bearing of 360 and upwards, this is ‘modulo’ arithmetic. 021°, 082°, 103°, 124°, 175°, 186°, 227°, 288°, 329°, 350°. Problems to solve often require scale drawing (KS3). That includes the difficulty of deciphering the words in a question. Often a pair of points is given and a third must be plotted (drawn precisely). 1. Draw points A&B 8cm apart with B to the East of A. Plot point C so that it lies on a bearing of 125° from A and 160° from B. Measure the lengths of AC and BC. You will be beginning to appreciate that you’d like your own maths set, sharp pencils, clear gradations on ruler and protractor. You might want a 2H pencil rather than B or HB. The lines you draw should have no appreciable width, the pencil point should drop neatly into the tiny hole made by your compasses point and your skills can (easily) reach such a standard. You should be able to reliably produce two significant figures precision. 4. From point O, OM is 800m and ON is 825m. From point N, M is at 295° and O is at 265°. Make a suitable scale drawing and find (i) length MN (ii) the bearing of M from O. This question is very like Q3 with less help; draw a small free-hand sketch first to see what you need to do. 5. Place point T for Tango top left of your next space and assume North is upwards. Point Uniform is on a bearing of 100° from T and Point Sierra is at 170°. The distances SU and TU are equal and 12cm. Find ST both (i) by measuring and (ii) by calculation and (iii) state the bearing of S from U. 6. Point Zulu belongs top right of this space. Yankee is off West by South (a little south of west) and Whisky is South by West. State the angle WZY. WZ is 70 km and YZ is 103km. Find length WY and the bearing of Y from W. Find point X-ray due west of Whisky and due south of Yankee and hence find length XZ and the bearing of X from Z.